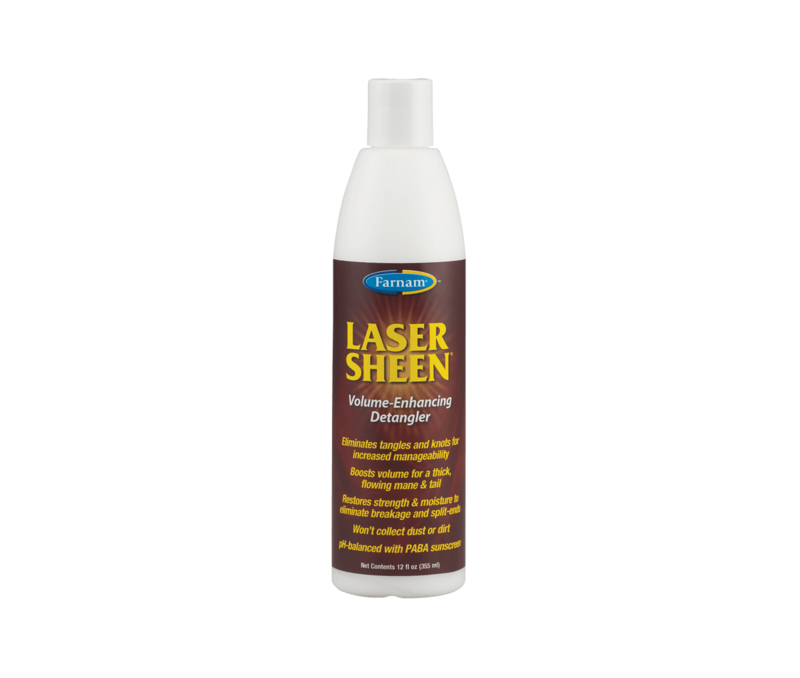 Unveil your horse's beauty with Laser Sheen® Volume-Enhancing Detangler. This winning formula easily eliminates tangles and knots, restores strength and moisture, and boosts volume for incredibly thick, flowing manes and tails to captivate any audience. Apply 1-2 teaspoons of Laser Sheen® Volume-Enhancing Detangler to your hands and gently massage into wet or dry mane and tail. Comb out in small sections from the bottom up. Continue to apply small amounts until mane and tail appear thick, smooth and radiant, creating the perfect image of beauty. Pour 1-2 teaspoons of Laser Sheen® Volume-Enhancing Detangler into a bucket and slowly add water while agitating. Dunk the tail into the bucket and gently swish, working product in with your hands. Keep tail submersed for 30-60 seconds. Remove excess water and let air dry. Comb out in small sections from the bottom up until tail is full, flowing and mesmerizingly shiny.